On this day, the third anniversary of the signing of the Recovery Act, I can say categorically and without hesitation that I'm pretty sure the stimulus worked, more or less. 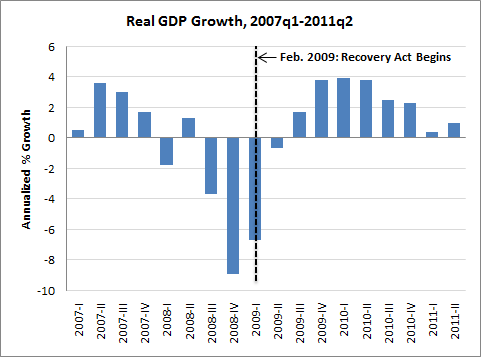 Here's the Congressional Budget Office and the Center on Budget and Policy Priorities with graphs showing that the Recovery Act -- aka: the stimulus -- increased real GDP by up to 1.9 percent (first graph) and added as many as 2.4 million jobs (second graph). Don't believe the CBO or CBPP? There are more studies for you. In Dylan Matthews's monster analysis of nine stimulus surveys, seven concluded that the stimulus probably worked and two concluded that the stimulus probably failed. Once again, if you're in the mood for certainty, click away now. All of the studies have significant drawbacks. Some studies concluded the stimulus worked with the same models that predicted that the stimulus would work years earlier. In other words, their conclusions had been reached, more or less, before the stimulus was signed. Another study gave the stimulus a failing grade, but it had such wide predictions that "anything between 1.5 million non-government jobs being lost and 1.5 million being created [would be] consistent with the study." In other words, it concluded next to nothing. Sick of experts? You can play Sherlock Holmes with the stimulus yourself. Here are three graphs of real GDP growth, private sector job creation, and unemployment -- three worthy measures of economic performance, but there are more -- with the stimulus indicated with a vertical black line. The upshot is that the stimulus coincided with a pretty abrupt turnaround in economic growth and private sector layoffs, as Michael Linden also explains in this great video. These are simple pictures that suggest a simple point: The economic turnaround coincided with the passing of the stimulus. 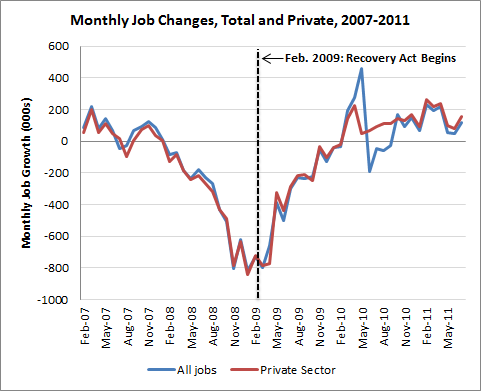 The month before the stimulus was passed was the worst month for private sector layoffs in 60 years. 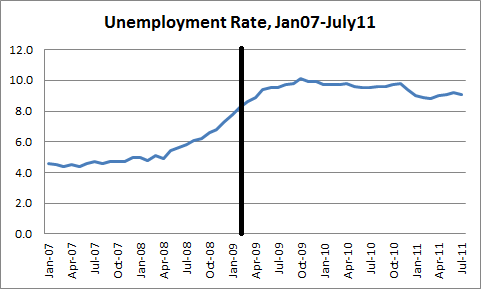 Six months later, the recession was declared to be technically over, even though unemployment continued to rise. Here's the catch. We don't know how well the stimulus worked beyond a doubt because we can't compare this world, where the stimulus happened, to a make-believe world, where it didn't happen. One cannot board one's time machine and travel to a parallel universe where the Recovery Act was never passed, and then another where the stimulus was 100% payroll tax cuts, and yet another where it was $2 trillion of government spending combined with massive public hirings. Even if I did have such a machine, and I did make such journeys, I wouldn't be able to control for the many variables that contribute to economic growth, such as oil prices and exchange rates, to make any findings in these parallel universes statistically significant. So three years after the Recovery Act was passed, I think we can say with reasonable certainty that the stimulus did support growth, prevent layoffs, and make the economy better. If you're looking for utter certainty ... well, don't read articles about economics.